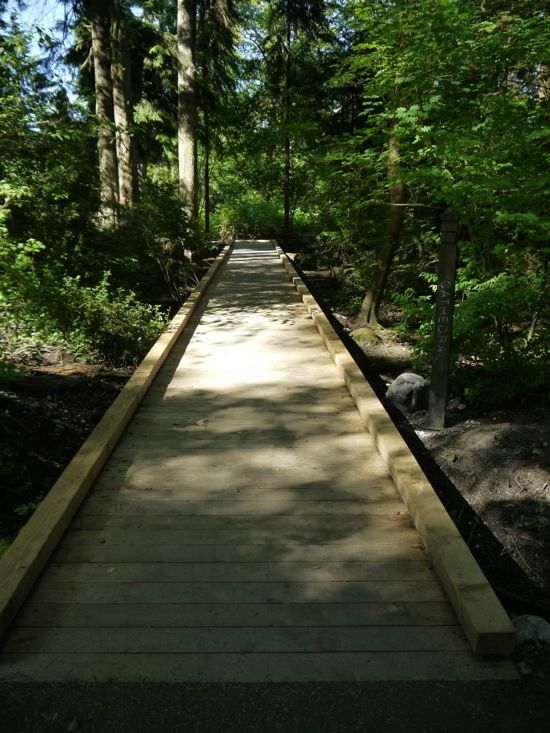 The Vancouver Park Board opened a new boardwalk in Stanley Park last week to protect and restore a sensitive habitat on Cathedral Trail. The project was a partnership with Stanley Park Ecology Society (SPES) This area was hard hit by the windstorm in 2006 and many of the knock-downed trees still bear monumental witness to the weather catastrophe. The Cathedral trail is just past lost lagoon on the edge of Stanley Park trails. The area is a very sensitive environment of a swampy bog that is home to some unique little creatures as moles and salamanders. The boardwalk allows visitors to access the area, but still protect the habitat from being harmed by the foot traffic. Categorized under: Vancouver Park Board. Tagged with: Boardwalk, Cathedral Trail, SPES, Stanley Park, Stanley Park Ecology Society, Vancovuer, Vanparks.